Below is a modified version of Jesse’s script for replacing @tomorrow with @today. With this script, a @today tag is only added to items that are tagged with both @due and @q (a random test tag). Everything that’s tagged @due gets a @today tag added. Additionally, @due(2016-03-02) gets @today(2016-03-02), but @due just gets @today. What should I be changing to only tag items that are due today? The trick will be to construct an item path that evaluates to a shorter list – only the items that you want to affect. Footnote: you can display code snippets on this forum with syntax highlighting if you precede and follow them with three back-tick characters. Thanks! What’s the purpose of the each.getAttribute ? 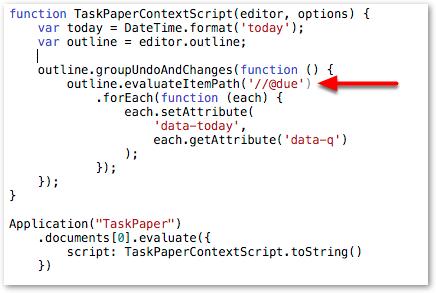 The each in that expression is the TaskPaper item/line which the ‘.forEach’ process is currently looking at. How is it choosing or deriving that value ? 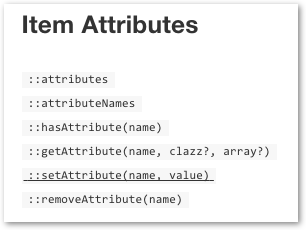 It’s using item.getAttribute to read a value from the same item’s @due(someValue) tag. Thanks for holding my hand through this! I really appreciate the time you’ve taken to explain everything. Also the complete fixed script for anyone who just wants to copy/paste something that works. You might have to spell out the logic of which tag(s) get thrown out of the balloon when multiples are found. @available -> @due -> @today -> @overdue ? in which any predecessors of the latest type of tag are considered redundant and get pruned out ? reduce heat (switch back to previous (cooler) tag type). where the predecessors get pruned out. No problem – take your time – thinking about sketching a script is always a good way to experiment and tease out a bit more clarity. Great! This looks very useful. Thank you very much!